Homocitrulline/Citrulline Assay Kit | Cell Biolabs, Inc.
Homocitrulline is an amino acid that is found in the free form as a metabolite of ornithine. It can also be found on proteins through the process of carbamylation, which involves the reaction of isocyanic acid with lysine residues. High levels of urea in the blood can lead to carbamylation, which has been associated with renal disease. Citrulline is an amino acid similar in structure to homocitrulline but is one methylene group shorter. Free citrulline is produced from free arginine during nitric oxide production by nitric oxide synthase. It is also synthesized from ornithine and carbamoyl phosphate during the urea cycle. Citrulline can be found in proteins as a result of post translational modifications and it can be formed by the conversion of arginine to citrulline by the enzyme pepdidylarginine deiminase. Our Homocitrulline/Citrulline Assay Kit detects total homocitrulline/citrulline in plasma, serum, urine, or cell and tissue lysates. Samples are first treated with sodium dodecyl sulfate (SDS) and proteinase K to release free homocitrulline/citrulline residues. 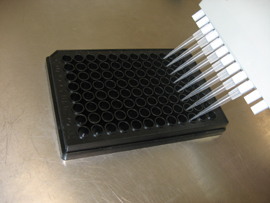 Assay reagents are then added, which react with homocitrulline and citrulline to produce a chromophore. The absorbance is read at 540-560nm and the levels of homocitrulline/citrulline are determined based on the provided standard curve. Sun, J.T. et al. (2016). Cyanate-impaired angiogenesis: association with poor coronary collateral growth in patients with stable angina and chronic total occlusion. J. Am. Heart Assoc. 5:e004700.